MANILA, Philippines - “Change is coming.” This has been the mantra of every Filipino who’s really clamoring for change in our nation. This motto has also been associated with president-elect Rodrigo “Rody” Duterte who’s really known for crime busting. In the evening of Tuesday, May 31, a concerned citizen who believes that Duterte can’t change the country by himself but should be strongly aided by everyone, braved the busy streets and chased the alleged group of snatchers. Under the administration of re-electionist Mayor Jimmy Fresnedi, Muntinlupa City is considered as one of the nicest city in the entire metro with a very low percentage of crime rate. 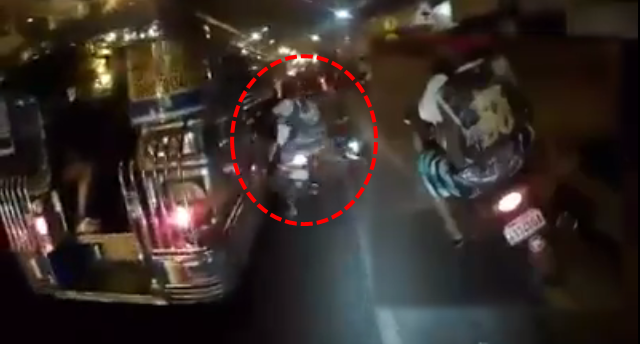 But on May 31, a concerned netizen, named Toto Ramos Pal, uploaded a video on his Facebook showing himself on a motorcycle, pursuing a group of young thugs on a motorbike as well who allegedly snatched a phone from a lady while boaded in a jeepney in National Road, Brgy. Bayanan in Muntinlupa. According to the video uploader, he was at the tail end of the jeepney and saw a boy running away from the public vehicle while pocketing a mobile phone which was believed to be stolen from the lady passenger. The crook all of a sudden rode a motorcycle along with two more accomplices. Without any hesitations and with the desire to help the victim in recovering his valuable, Toto sped-up and chased the suspects. Everything was caught on his go-pro camera and even the unfortunate accident that happened to the alleged snatchers who hit a gutter and bump-off a rushing jeepney. The three young boys all fell from their getaway vehicle and ran towards a dark alley. A police mobile out of nowhere noticed the incident and run after the group of young hooligans with the help of Toto. The PNP has been constantly reminding the public to refrain from displaying any gadgets while inside any public utility vehicle especially at night. In case of emergency matters where there’s a need to use a cellphone, get out of the vehicle, go to any convenience store where there’s enough size of crowd and do the calls or text messaging. In case of snatching and even hold-up incidents, go to the nearest police outpost and report everything so that the authority can do a follow-up operations. Please don’t try to fight back or chase the suspect by yourself, by that, you’re placing yourself in danger. Gadgets can be easily replaced while life is not. A friendly reminder from the Summit Express. To the video uploader, hats-off to you Sir for your heroic acts and bravery!